I am writing to thank you and Mrs. Bodman for your kindness in having my wife and me with you during our visit to Berkeley. We both enjoyed the opportunity of becoming acquainted with you very much. I have been delayed in writing to you because of my trip to Europe. I was glad to see our second son, Peter, in England, and I had a good time at the Solvay Congress in Brussels. Then I came back to New York, by way of Iceland, and met my wife there. We spent a few days in New Haven, and then went on to Philadelphia, Washington, and Buffalo. I gave the Treat B. Johnson Lectures in New Haven, and the Foster Lectures in Buffalo. Since getting back to Pasadena I have been kept busy taking care of accumulated business. I have also been herd at work on the problem of the structure of collagen, and just a few days ago I succeeded in finding a structure that seems to me to be the correct one. Letter from LP to W.H. 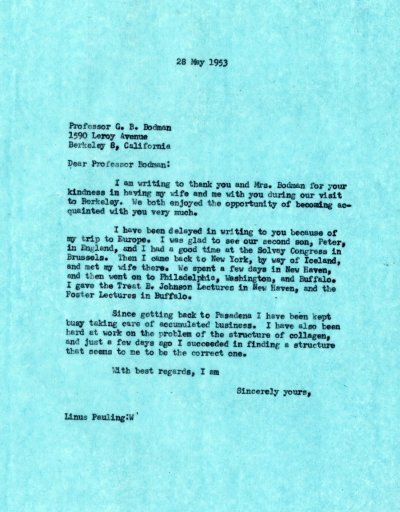 Freeman RE: Informs Freeman of his June 7, 1953 travel plans to Cincinnati and hopes that he will see Freeman when he gets back to Pasadena. [In reply to May 26, 1953 letter from W.H. Freeman to LP]. [Filed under LP Books: Box 1953b, Folder 1953b.1]. Letter from Stanley Schaefer, W.H. Freeman and Company, to LP RE: The typesetting of the second edition of General Chemistry is well underway and the first galley proofs should be available on June 15, 1953. [Reply from LP to Schaefer June 2, 1953]. [Filed under LP Books: Box 1953b, Folder 1953b.1].